Water, digital technology, and sustainability are merged in this new reinterpretation of the iconic but now underutilized Seoul Olympic Stadium. A temporary structure to house the international Seoul Design Olympiad (SDO) events, an inflatable arch is held away from the structure of the historic stadium. 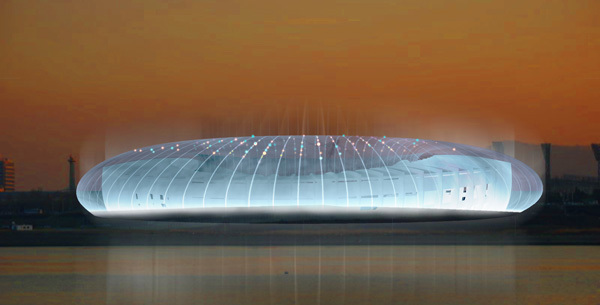 Through a simple process of condensing water on the surface of this inflatable structure through solar evaporation, rain runoff is purified and ‘misted’ to create a white volume that catches digital light and defines new energized events. The mist also nourishes a nursery of culturally significant trees within the center of the stadium. At the end of the event, these trees are placed throughout the city of Seoul according to the city’s masterplan, extending the positive memory of the white stadium. 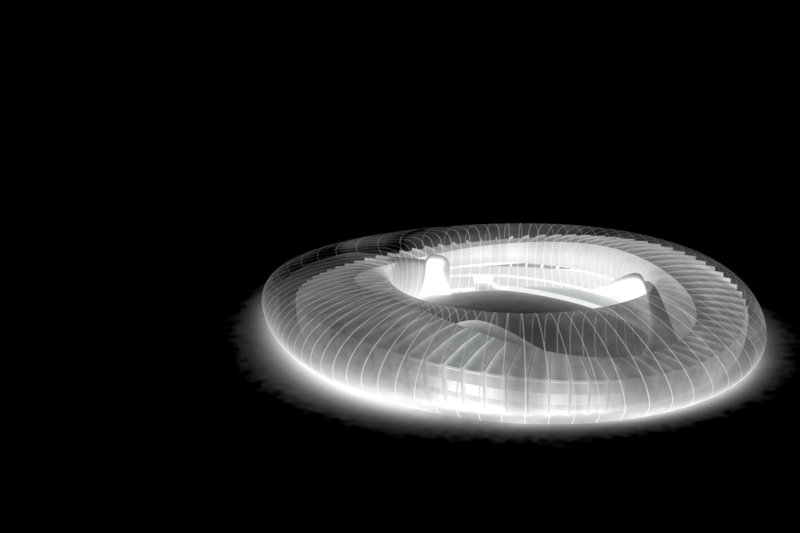 Inspired by the simple and elegant pottery of the Baek-Ja era, the stadium becomes a new urban figure. 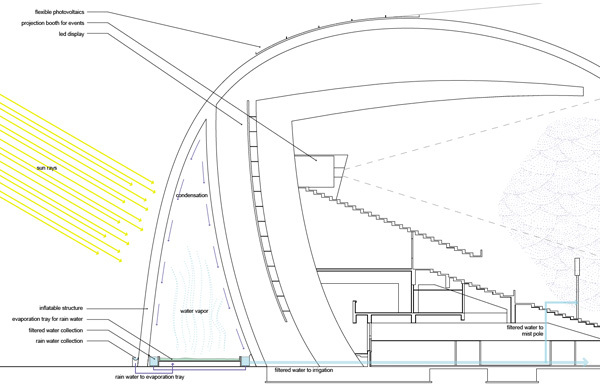 By using an inflatable structure combined with a simple process of condensing water in sunlight within the inflatable, the mist at times hides the stadium and then allows it to reappear giving the existing building a new sense of life. 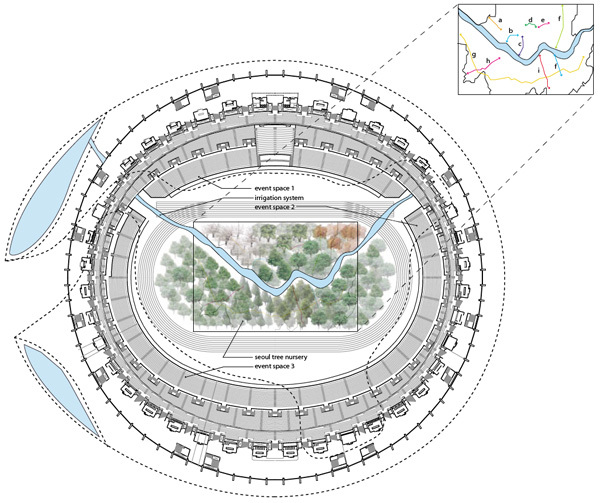 As the stadium fronts the Hangang River, contaminated water from the river is purified through the condensation process and used to water a grove of trees. The simple process of purifying water through condensation is demonstrated. The nursery of trees is then relocated to different parts of Seoul according to the city’s masterplan. The alliance of the two major municipal projects creates an overall savings for the city. The purified water is used for irrigation as well as well as for creating atmospheric mists for events. View from the Han River: Changing patterns of white mist illuminated by LED’s define the underutilized existing stadium as a new event space. The purification of the water into mist allows the public to understand the importance of the river.